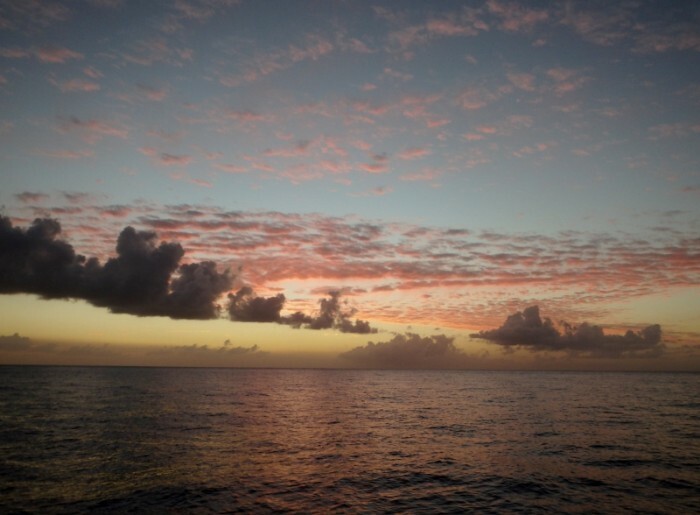 Left St. Barth late Thursday morning after picking up some good french pastries, motored sailed 6 hours and attached to a mooring ball between Ladder Bay and Wells Bay off the island of Saba, 5 square miles of island that reaches to a lofty 3000 feet. Cut into the steep rock are more than 800 steps that lead to the old customs house which is halfway up. This was the only way onto the island until the mid 1950s. Watched a beautiful sunset over the open sea, had dinner and watched a movie aboard. This morning, we took the dinghy surfing across the rollers to Fort Bay where we checked in, made diving arrangements for Sunday, enjoyed lunch at a small restaurant on the waterfront, and are working on making arrangements to hike the 3084 feet to the top of Mt. Scenery in the middle of the island.